MidAmerica Basement Systems is dedicated to informing homeowners of the benefits of basement waterproofing and crawl space repair. Our goal is to provide a healthy, safe home environment and to expand living and storage space in eastern Iowa and western Illinois. 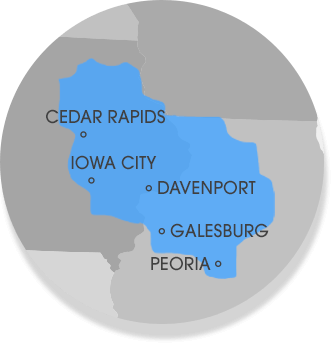 We service Eastern Iowa and Western Illinois for basement waterproofing, crawl space repair, and foundation repair. If your city or town is not located in the list below, please visit the Basement Systems National Headquarters website and fill out the contact form. Your local specialist will contact you about a free basement waterproofing estimate or free crawl space waterproofing estimate.